Did you know the story behind "Fallen"? Last weekend, I was having fun listening to "old" songs while working on my miniatures. One of the older tracks I was listening to was "Fallen" by Lauren Woods. I hope most of you would know that song. It was so popular in the movie "Pretty Woman" by Julia Roberts and Richard Gere. Anyway, I google on Lauren Woods, and realized that she wrote the song around 1979!! It was produced in an album in 1981, but didn't make it as a soundtrack of the album because the record company felt it had no chorus or real drums. 10 years later, the song was re-mixed and made it into"Pretty Woman" in 1990. The rest is history. Perhaps the next time you hear this song, you'll have new found respect for it. I truly did. It took her 10 over years. That's sheer dedication and patience. And I believe she never gave up on her passion. Some might say, it's luck. But what is luck if you are not prepared, and if you didn't believe in it? 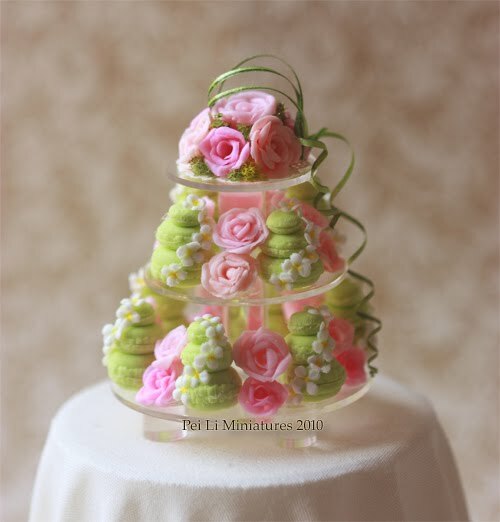 Revisited miniature roses making lately again. Here's a picture I took recently on the roses I did while experimenting colours. I took it together with the pot of peonies (on the way to Dales!) just so that there is some colour comparison. Ok, back to making some more roses. It's been a while! Do you like the new look on my blog? 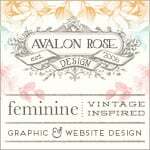 I have to thank Catherine of Avalon Rose Designs for creating this for me. She's a wonderful designer and I just love her style so much. I am so glad she captured the little aspects of me in this design. I love colours; I want people to be happy upon coming here. 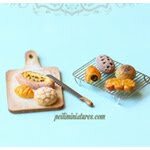 I want it a little homely, and having yummy treats all around. I've been working on my webpage for a while now too, thinking through what I want to have on there, and it did take some time. Though it's still work in progress I think, but I am happy to have come through so far. I also want to announce that I'm officially starting to teach adult classes, in creating 1:12 scale miniature art. :) It has taken me a long time to conceptualize things, putting things, ideas into place and deciding to do it. I will be adding more classes slowly, but will first start with this. This is another inspiration I took from a home decor book. I get so excited when I see the possibility of turning things into 1:12 scale miniatures. I saw a photo of a clean white decorative pan. The frying pan or the aluminium square griddle doesn't have to stay on the stove! The person who have these ideas is just ingenious. 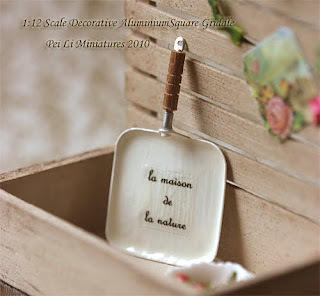 So, I tried to make one myself, and turn it into a home decor piece (in miniature scale, of course!). I love the outcome. And this is just such a great decorative piece. 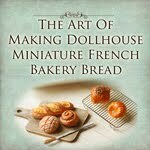 Imagine it on your dollhouse kitchen wall. Just so charming! Oh, and I made the decal myself too. In literal translation, it means "The House of Nature". 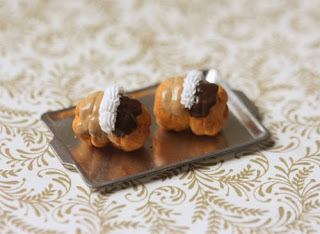 Just sometime a while ago, my friend Marie forwarded me a photo of "Duo Religieuses". I believe most of us, including myself would probably have heard of Religieuses, but this is the first time I have heard and seen a photo of Duo Religieuses. 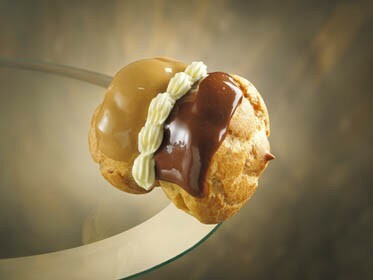 I wouldn't have thought such a pastry existed if Marie didn't show me a photo of it, but now I know! According to her, it's not very well known, but just so special and different! 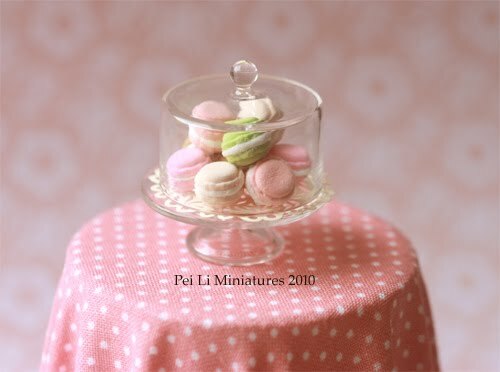 The most important thing about making dollhouse miniatures macarons for me is the colour, especially if I am making it as a display. These days, I no longer just use a tube of colour for one shade of macaron. A shade of pink is a mix and match of 2-3 other colours together, and I don't mean just white and red. Although in colour term, white and red produces pink, but when it comes to air dry clay (and depending on what clay you're using), white means a totally different thing. I mix colours into the air dry clay until I find the right shade of pink. The tough part about this is, if I knead it too much and the clay becomes dry, I can't use it anymore and would have to trash it. Just the other day, I was looking at some macaron pictures in a book I found, and I just had to get those muted shades. The challenge with those muted shades is that you can't achieve them by just adding a main colour and white. All of the shades achieved here, were a combination of several colours together. Even a little dab of each does make a difference. And guess what, by the time I found the right combination, I don't remember how much of each and what I've added, because I have tubes of paint lying around. LoL. The below photo is an illustration of that experiment. I'm happy with these muted soft shades. 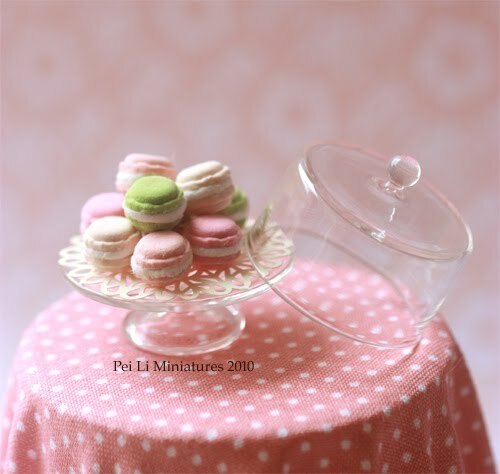 Went to the dentist, then got a craft book and also completed a miniature macaron display. 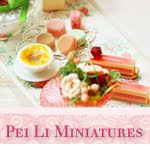 The height of my miniature & inedible version is approximately 5cm. Base is 3.5cm. 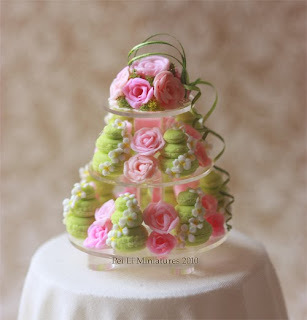 The most tedious part making this, was definitely the roses. I did quite a good progress on my snacks miniature shelf this weekend. I finished folding 18 miniature pocky boxes. But there are still a few other ranges to go for pocky. AND...my old PC decided it was time to retire. I couldn't get it started on Sunday. It has been for 4 years, and it's about time to change a new one, so I ordered a new laptop (to make more space on my table). That would arrive in a week. Therefore, I can only post pics up after I get my new laptop!